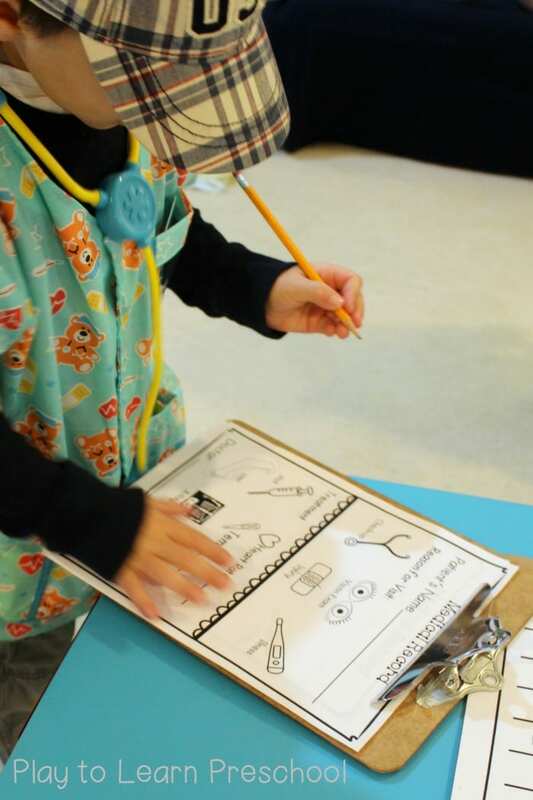 Hospital Dramatic Play: Paging Dr. Preschooler! 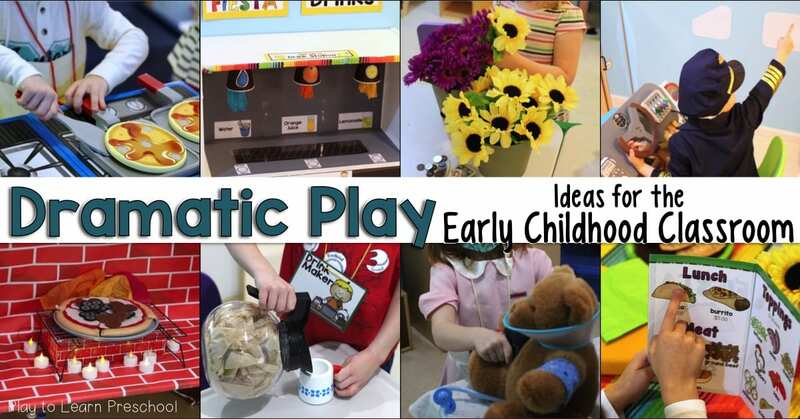 Another month means another fun dramatic play center for our preschoolers! The area is our kitchen, and we leave it as a plain housekeeping center for a week or 2 each month. During the other weeks, though, we invite our kiddos to serve pizza or pancakes at a restaurant, fly to far away places in an airplane, sell cookies in a bakery, and shop at the grocery store. 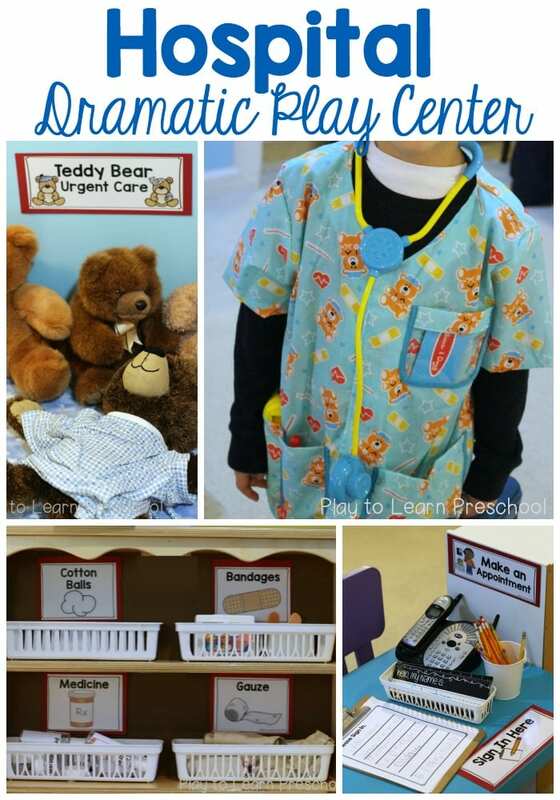 Of all these awesome dramatic play choices, our favorite center is always the Hospital. 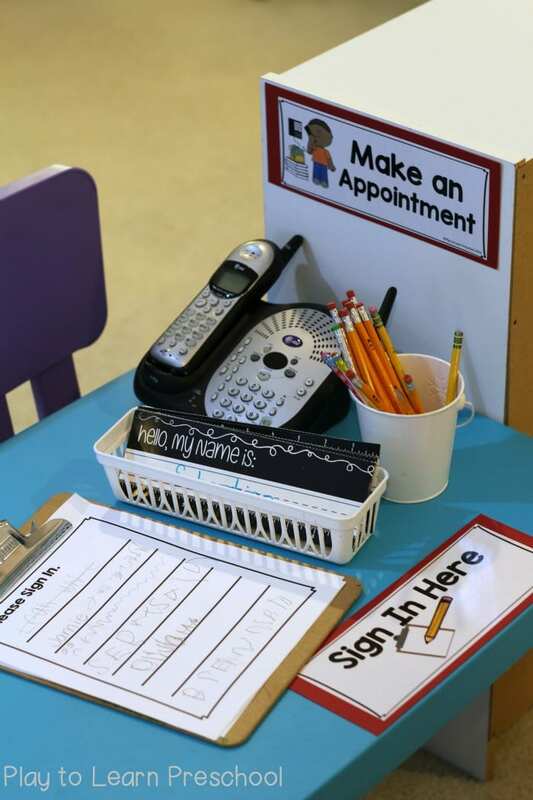 When patients arrive, they have to sign in with the receptionist at the welcome desk. Then our patients sit in the Waiting Room until the Nurse calls them back. Each Hospital employee (and the patients too!) need to find a role play name tag. 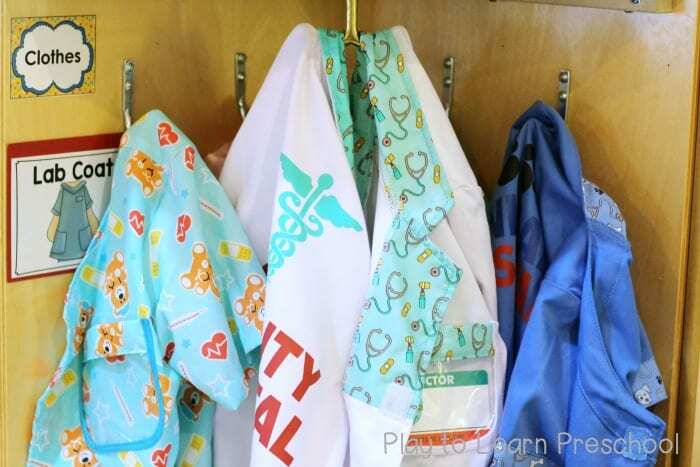 Then they can find their lab coat and a bag of medical supplies in the dress up closet. 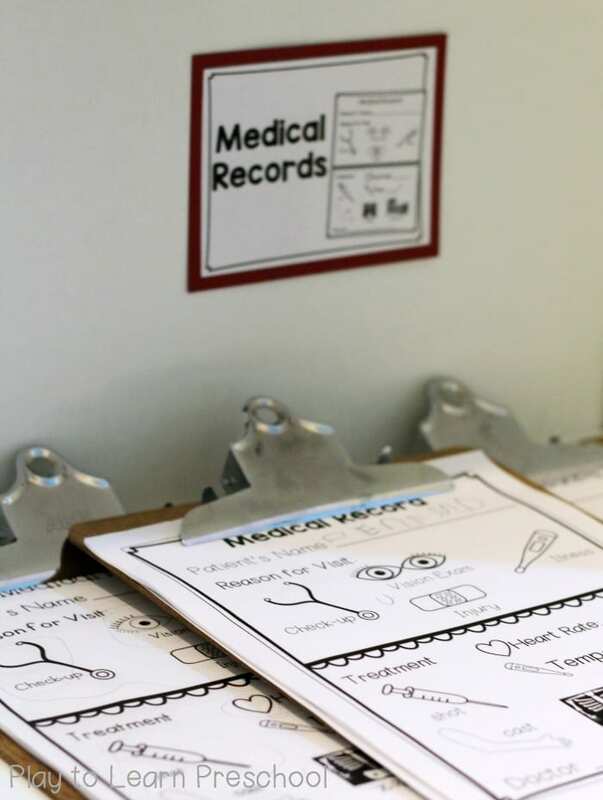 We keep all of the medical records on clipboards. 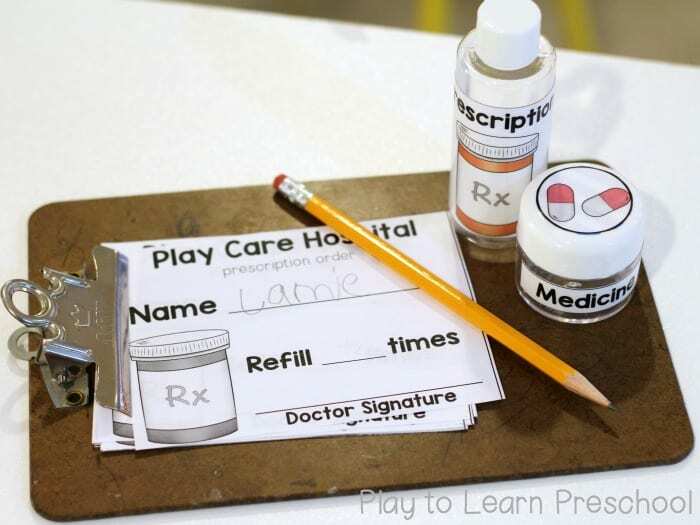 The doctors write on the pages and then send them home with their patients. 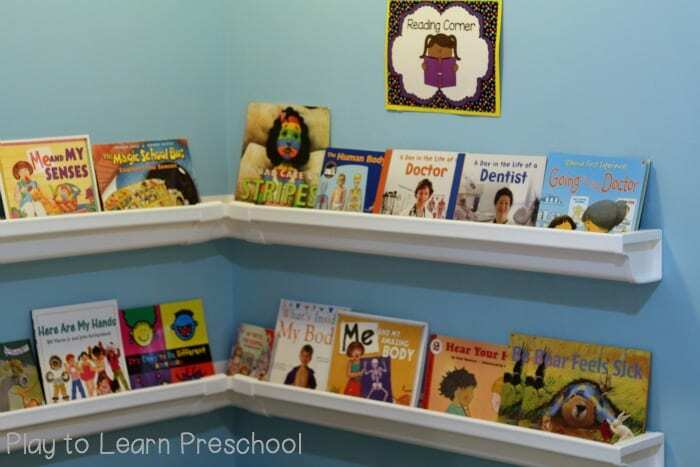 Preschoolers love to take these pages home! The hospital offers a full range of services including casts, blood pressure screening, (lots of) shots, and vision exams. 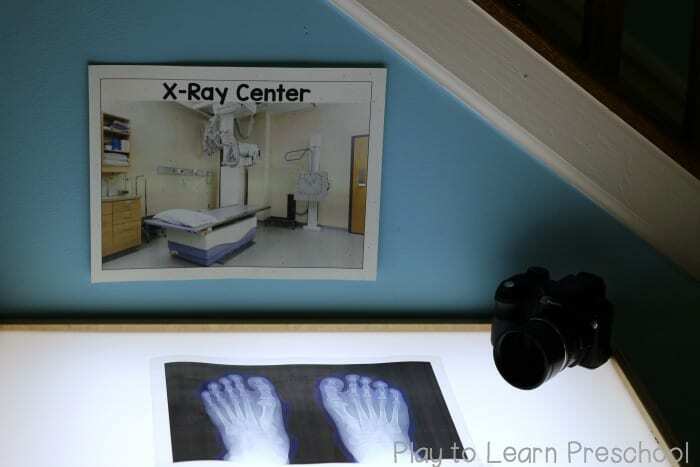 Our light table acts as an x-ray center. Baskets of medical tools are located around the hospital. We labeled each tub with a picture so that at the end of each shift, the orderlies would be able to return the equipment to the right spot! 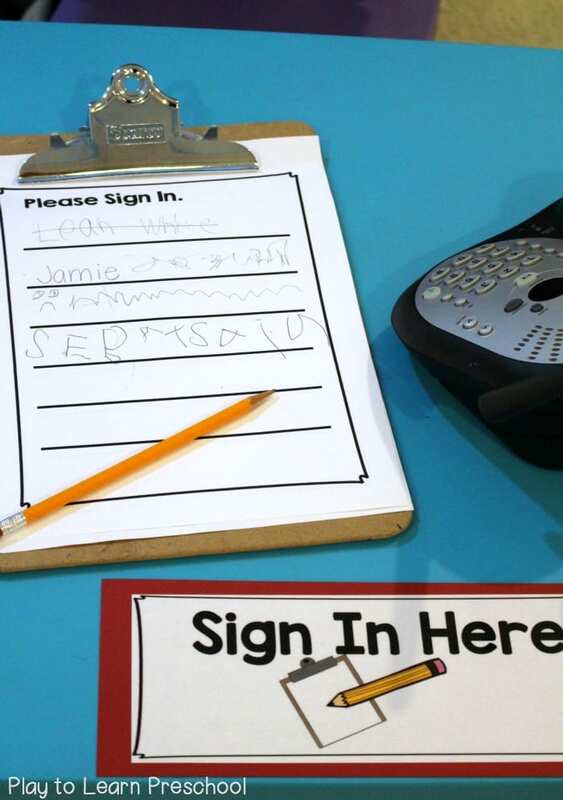 We always look for ways to incorporate lots of literacy into dramatic play. 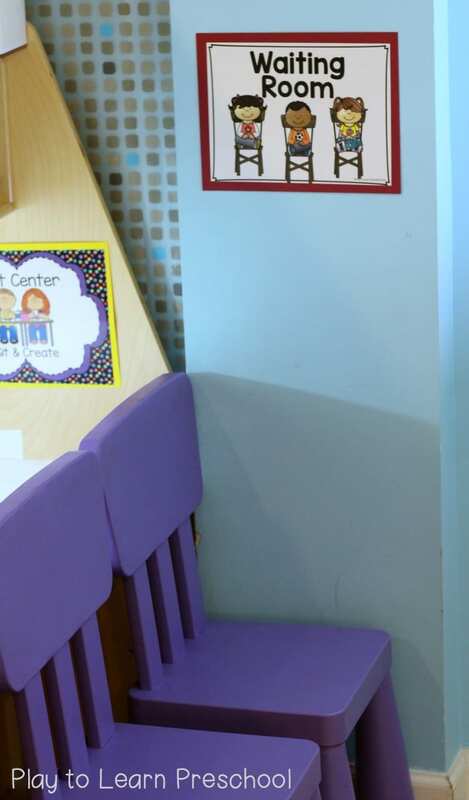 Our students read about doctors, hospitals and healthy bodies in the reading corner. 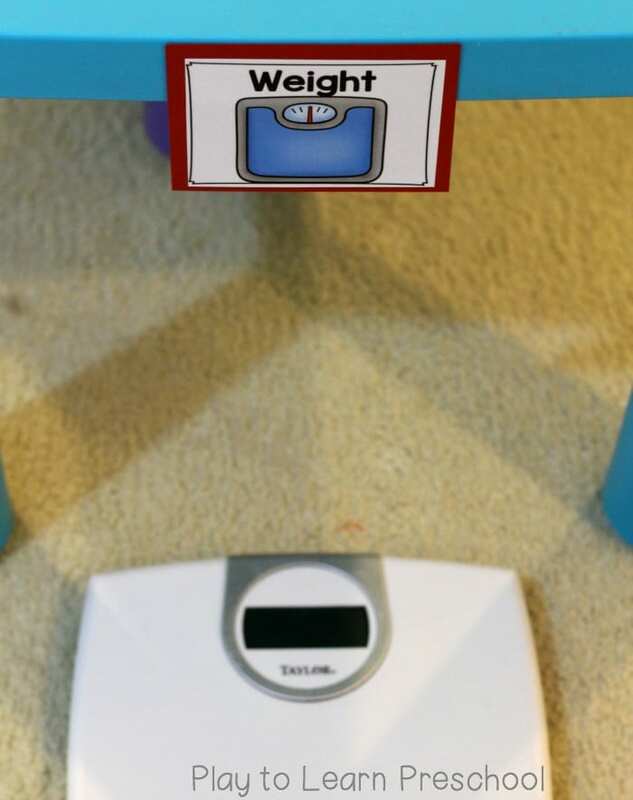 We also find ways to incorporate math. 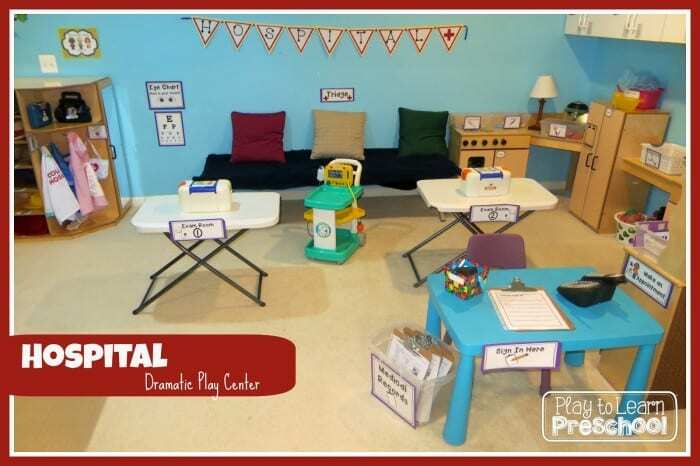 A hospital or doctor dramatic play center lends itself to lots of practice with measurement. One of the problems that we run into is that everyone wants to be a doctor and no one wants to be the patient. 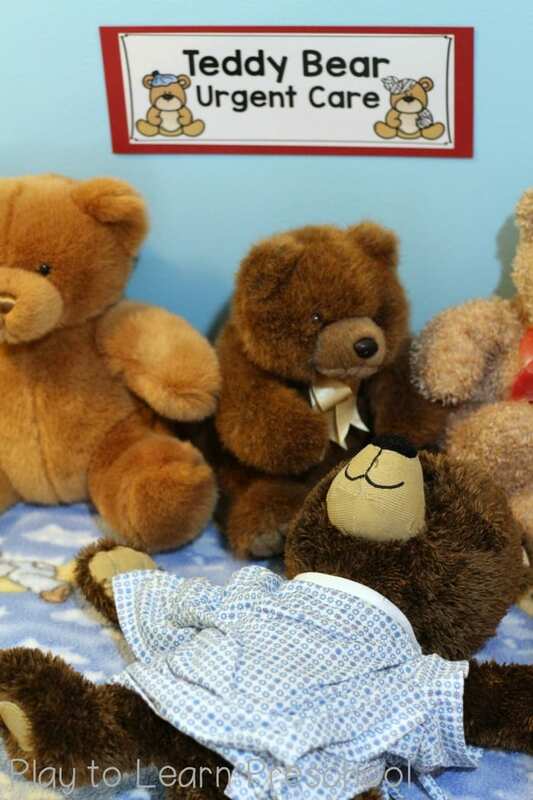 We added a special “Teddy Bear Urgent Care” so that our sick stuffed friends could be seen by the doctors too! Our students love, love, love this center! Many of them spent the entire hour and a half of centers being patients, doctors, nurses and other hospital workers. They love to take care of the teachers and each other. So much learning takes place as they negotiate their roles, discuss their health issues, use new vocabulary and interact with each other. All of the signs, labels, name tags and medical record forms for this hospital center are available here. Hi Jamie! I found your blog through the "I is for Inspire" blog. Congrats on your nomination for the Liebster Award. I love finding other pre k bloggers! This is such a fun post! My kiddos would love this for our home center. I look forward to reading more of your posts. Thanks Paula! I enjoy reading your blog, too, and just added it to my blog roll on the right side of my page. Neat ideas, what is the green object in the middle of the room for the doctor theme? what are the white boxes on the two exam tables? 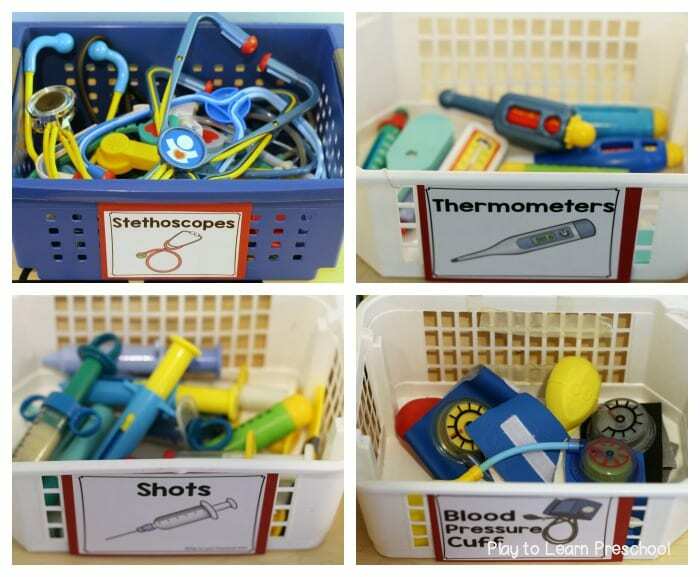 Little toy medical kits– a yard sale find! Hi I love your home center!! I was curious where you found the white tables at?